Greetings fellow tennis lovers and thank you for exploring our tiny bastion of cyberspace. As the founder and owner of Guts and Glory TENNIS, LLC, it is my distinct pleasure to provide tennis players in NE Metropolitan Atlanta, and across the country, a unique choice in professional racquet care and terrific tennis products. I have been an avid tennis player for more than 25 years. My tennis resume includes playing #1 doubles and #2 singles for two years at the perennial NCAA Division II tennis powerhouse, Ashland University. 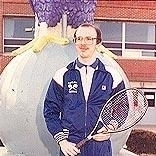 (Get a load of that silk Fila team warm-up and Yonex R-22 that I was sporting back in 1986!) If I recall correctly, the caption under the color picture in the yearbook read something like "Serving up a little eye candy for the ladies!" I have always been extremely "picky" and "finicky" in regard to my tennis equipment. From early on I have been blessed, (though my wife would argue "cursed"), with the ability to distinguish even the slightest differences in string tension and quality. Because of my particular obsession with having high quality strings at perfect tensions, it became apparent that for my own personal economic and mental survival I would have to learn to string my own racquets. This is, by far, one of the most serendipitous decisions I have ever made. Ultimately the decision would come to alter my career trajectory and change my life. Almost instantly I became enthralled with the various methods and styles of stringing. I literally became obsessed with learning the intricacies of the trade and worked long and hard to develop expertise in the profession. I began stringing for my teammates and friends and found they kept returning to me and bringing their friends. This word of mouth advertising propagated a cult-like following, a curious phenomena. Apparently the service and quality I provided far exceeded what they were finding elsewhere. Because of the feedback, praise and encouragement I have received from many friends, and friends of friends, I decided to legitimize this obsession and form a tennis stringing and supply company, thus Guts and Glory TENNIS, LLC was born. As a tennis player I know first hand that high quality strings, properly installed, make a huge difference in the playability of the racquet. My goal is to provide high quality service and products to my tennis playing colleagues and customers. I aspire to earn a reputation as the premier tennis stringing service in the Metropolitan Atlanta area and become a resource for those who do not have easy access to quality stringing services. Thank you for taking time to learn a little more about us, we hope you will choose Guts and Glory TENNIS to serve your future tennis needs.